" I always thought those kids could do with more protection. So that's what's happening now. Me and the rest of us, we're protecting them. Not the ones you've already killed, obviously. But the next ones. " Bel is a fairly average-looking woman. She's not especially large or small, and her features are nothing particularly unusual. Her skin is relatively light, but can get fairly tan fairly quickly once she's gotten over the initial sunburn. Her hair is a medium brown, and quite curly, and her eyes are about the same color. Her eyebrows are somewhat thin, and her face is rather oval-shaped with somewhat sunken cheeks. She's gained a few lines with age on her face, and her hair is a little more dry and unruly than it was when she was young, but just about every woman experiences that. She's otherwise doing pretty well for her age, really. She's often cold, and usually dresses more warmly than the weather necessarily calls for. She's fond of knit items, especially sweaters and scarves. Even at Semaca, she's likely to wear long sleeves. Bel can be a bit of a chatterbox at times, not really knowing when to stop talking. She's cheerful and gregarious, and that all covers a near-overwhelming sense that no matter how hard she tries, the world will return to war. It is her greatest fear, and when threatened with physical violence she nearly shuts down. It's only Naluth who can talk her out of it, and even the green can have trouble talking her through a battle. She has a serious distrust of metallic dragons and leadership based around them, but she doesn't have much faith in any leadership, believing that even those who are good when first taking such a position are eventually corrupted by power. She's dedicated to eliminating that corruption, no matter what it takes. She'd sacrifice any one of her morals for that cause, save one: anything that puts her kids, or any kids, in danger is an absolute hard line. Kids are the world's future, and she would protect them with everything she has. Despite her distrust in leadership, Bel is mostly an optimist. She believes that even if people aren't always great, things will work out for the world in the end. Look at High Reaches; with Golre gone, it's doing fine. Semaca has so far avoided the pitfalls of previous Weyrs, and if it continues on that path it will be fine too. She's rather loving and affectionate, toward both her children and anyone she gets involved with. But especially her children. They weren't necessarily planned, but they're hers and forsk anyone who tries to get between her and them. Beliana, lucky her, was born at High Reaches during the war. Her father was killed when she was still an infant, and her mother was too busy being a soldier to care for a child. She grew up mostly in the creche among the other children, and has never been particularly close to her mother. Outside of visits a couple times a Turn, they don't really know each other at all. From a fairly young age, Bel wanted nothing to do with war. It didn't personally affect her much, but she saw the kids in the creche who had lost parents they loved or worse. Despite both of her parents being riders, she had no such ambitions. If she were to be honest, she didn't want to stay at the Weyr at all. By the time she was a teenager, she had decided that she didn't believe in the High Reaches leadership or in the reasons for the war at all. She believed that it was petty and terrible. She apprenticed as a Healer, because at least Healers don't go to war, they only clean up after people who have. But she stayed. Because maybe things would get better. They had to. When they didn't, she thought that if she Impressed, maybe she could make things better. And she did Impress, when she was nineteen, to green Naluth. But that didn't make things better; if anything, it made things worse. She and Naluth were trained to be soldiers, to put themselves in the line of fire before all others, because they were only a green pair and their lives didn't matter. Even though Bel was useful as a Healer, she was considered more useful still as cannon fodder. Still, she did it, because maybe after a little while it would end. Time and again she and Naluth did what they were supposed to, flying out in the front. Naluth was vicious, but Bel was mostly just scared. She hated war, and it would plague her nightmares the rest of her life. There were brief periods of respite, when Bel got pregnant twice. Her kids became the one thing keeping her from doing something drastic, and she remained close with them even though they were raised in the creche. She became more careful in battle, though Naluth wasn't fond of that. The pair of them suffered their share of injuries, mostly broken bones from being hit by larger dragons, but they still made it out mostly without lasting damage. It ended. It finally, finally ended. For a time, things really were better. Kind of. The pair was still all but trodden upon for being chromatic, but Bel didn't care because the war was over. Thread came, and they had a purpose. They were put in the Healer's Wing rather than with the fighting wings, as Bel had walked the tables shortly after her second pregnancy. She felt useful, like she had a purpose. But peace didn't last; Golre declared her own war on Fort, and again Bel and Naluth had to fight. Those two battles, at least, were the end of Golre, and things began changing rapidly. Bel approved, tentatively. She still doesn't know how long things will last, but it's an improvement. However, with the advent of Semaca Weyr, she's decided that she's had enough time at High Reaches. Even though it's been her lifelong home, it's too full of memories she'd rather not face. So she decided to transfer, her skills as a Healer being useful, and talked both her kids into coming with her. Naluth is an undeniably beautiful green. 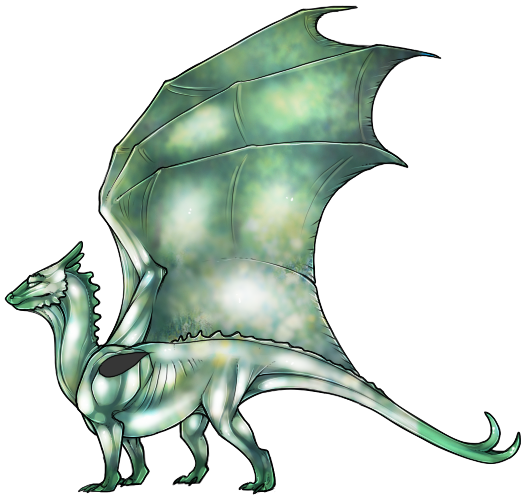 She's mostly a pale, silvery green, mottled with darker forest greens and yellowy greens, especially on her wings. 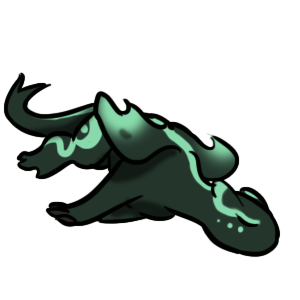 Her feet and the end of her tail are a slightly brighter kelly green. She's built light and lean, a zippy green despite her relatively tall height for her color. She has a few scattered scars, faded into paleness that doesn't show easily against her hide, but she's still rather sensitive about them. Her voice is rather soft, almost deceptively so, and with a lilting quality to it that will quickly turn to hissed anger at the drop of a hat. Naluth is, in a word, fierce. She's vicious in battle, and refuses to back down for any reason. Her emotions are rarely hidden, be it battle rage or lust or a rare playful mood. Everything she thinks or feels burns brightly, and she will use it to every advantage she possibly can. She's ambitious where her rider is not, and when in conflict with someone wants to crush her opposition through any means necessary. She cares only for Bel, and even then she can often get irritated with her. She doesn't understand not wanting to battle, but is still rather good at comforting her despite that. She's also a bit on the vain side, fond of her appearance and fully aware that people think she's pretty. This too she'll attempt to turn to her advantage. She's almost downright sinister about it though, somehow seeming almost snakelike, and it rarely really works.